Daikon is a crunchy, mild-flavored and peppery radish and adds a refreshing touch to spring rolls. Add or improvise ingredients to suit your taste. Fill pie pan or shallow pan with water, warm or cool. One at a time, soak rice paper wrapper in water until it is soft, but not falling apart. Place it on a dry plate. Layer a bit of each ingredient in the center, leaving room at the edges to fold over. Fold sides toward middle to create pocket ends, and then roll up from center. 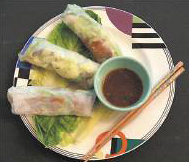 Place on separate plate and continue preparing additional spring rolls. If making ahead, cover with plastic wrap or slightly damp paper towel and refrigerate to prevent drying, Serve with your favorite dipping sauce.